Bighorn sheep are excellent ambassadors for their beautiful and austere alpine environment. They thrive in the extreme elements of the Rocky Mountains that create the safe harbor of their existence. With Epic Heights, Dan Smith achieves in this painting a balance between the sheep and their habitat that stirs the soul and speaks to the spirit. Daniel Smith resides in Montana, where the rugged peaks of the Gallatin Range are the only thing separating him from Yellowstone National Park. He is inspired by his surroundings. One of the most rewarding elements of his work is time spent in the field; it is the genesis of all of his paintings. Smith is passionate about his subjects and frequently travels to seek artistic inspiration. 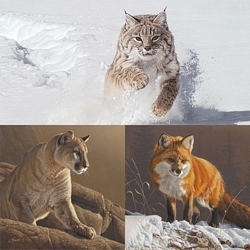 Unveiled at the 2014 Masters of the American West Exhibition and Sale, this Fine Art Edition Giclèe Canvas showcases how his meticulous field research and insistence on directly observing the animals he paints achieves a work of great authenticity.